It takes a brave warrior to go in search of the 5 Golden Dragons and the 200,000 coins and many other treasures you can be rewarded with for finding them – and I mean brave as the Golden Dragons jump across the 5 reels and 20 pay-lines of this fun slot just as you're least expecting it! But that's all part of the fun that Mazooma have packed into this vibrantly coloured slot, which takes place against the backdrop of an Ancient Chinese Temple in which you can find an assortment of Chinese themed prize symbols, as well as Wild Fire Symbols, and Ying and Yang Bonus Symbols that trigger a Free Spins Bonus in which you can enjoy the unique Stepping Wilds Feature. Starting this journey is as easy as choosing what bet you want to place, and you can do this by choosing to place bets of 1 to 500 coins on each of the game's 20 pay-lines, allowing a minimum bet of 20 coins and a maximum bet of 1,000 coins per spin. 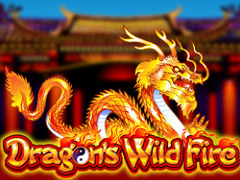 This allows the game to be enjoyed on many bet-levels, but high-rollers will be especially attracted to the 200,000 coins for lining-up the 5 Golden Dragons, whilst there's lots of other high-rewarding symbols including the Fighting Dragons at up to 150,000 coins, and Gold Coins at up to 125,000 coins. But you only need to line-up 3 or 4 symbols to win some smaller prizes to keep you bank ticking over, and there's also plenty of familiar Poker Symbol Prizes which will help do that, too. Prize-lines can also be boosted by the appearance of the Wild Fire Symbol which are only too happy to substitute for other symbols to make you winning combos, or make winning combos bigger. The Wild Fire Symbols are also prize symbols in their own right though, and 3 will win you up to 50,000 coins, 4 will win you up to 200,000 coins, and 5 will win you up to 250,00 coins. The Chinese are great believers in the power of the Ying and the Yang, and hopefully you'll feel that power by seeing the Ying and Yang Symbols on reels 1, 3 and 5 at the same time. When this happens you will be awarded 7 Free Spins in which you can enjoy the brilliant Stepping Wilds Feature. Before each Free Spin you must select in which direction you want the Stepping Wilds to step then, after the reels have stopped, all Wilds will step in your chosen direction of up, down, left or right. They will take 1 step at a time, rewarding wins as they do so, until all Wilds have stepped off the reels – which can mean some big multiple wins on any Free Spin! Mazooma are always looking to create the type of slot that attracts high-rollers with the lure of big pay-outs, however their games can also be enjoyed by all types of slot player. And, though sometimes they may have been guilty of making too many similar games, the stepping Wilds is a fantastically unique feature that you should never get tired of – a dragon slot that truly has fire in its belly!